ACRyan, one of the fastest growing names in media streaming devices, is planning to launch its first Intel-based streamer in March this year. We had a sneak peek at the FLUXX box and a very impressive looking bit of connected kit it is too. Packing the 1.2GHz Atom CE4150, 1GB DDR3 and built in storage ranging all the way up to the 2TB mark, the FLUXX is a powerful little streamer. As well as the usual, almost limitless format support, the FLUXX includes its own application store, and will have a host of names ready at launch offering downloadable and/or streamed content at the touch of a button. These will include the video-on-demand services as well as casual games, weather and news reports and a full, Flash-capable web browser to access all the goodies that don't necessarilly come with a widget. The dual-core Intel Atom processor also brings its own DRM to the table, making the FLUXX a more attractive proposition to content providers. ACRyan's team believe that this year could see movies being available on the FLUXX as soon as they're out at the cinema. The FLUXX remote is very button-happy, with a full QWERTY keyboard on one side and a host of shortcut and navigation buttons on the other. 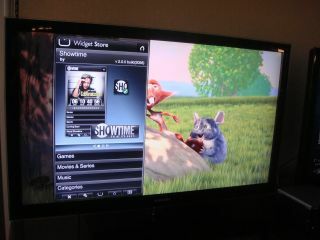 Compared to the simplistic Boxee remote, this is a very different take on things. Though ACRyan maintains that the important, oft-used buttons on the front of the remote are all within reach of the average thumb, making that less of an issue. The remote pictured here is just a prototype, but the basic design will remain, though the buttons' colour scheme will be reversed so as to have black buttons with white text on them. These remotes will also be available as an optional upgrade for the existing PlayOn media boxes too. Look out for a full review of the ACRyan FLUXX in the next couple of months.